I can’t believe what goes on in this world another crime against ourselves, our own humanity. Why won’t we let each other love in peace? 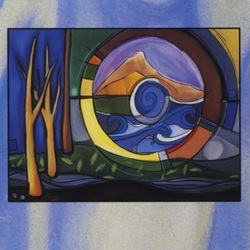 On the 1996 This World trio CD, brothers Rob and Lee Kohler, bass and keyboard, and Michael Blessing, percussion, mix their own sounds with Native American singers, recordings of youthful joy, and soprano saxophone, to add rich layers of sound and meaning to the trio Mixed by award-winning producer Cookie Marenco. The quality of this recording matches the players' abilities. Lee Kohler writes lyrics. His extensive organ and classical piano training are evident in his composing and playing, combining the traditional with his own concept. Rob Kohler has a distinctive solo voice, and is an aggressive bass player, evidenced by his Who's Who jazz experience at the Stanford Jazz Workshop, where he regularly works as a bass instructor. Blessing is an exciting composer and percussionist. Often the sounds of his drums explode and whisper in the same song.